I have to admit, I am always skeptical about trying new beauty products. In my 35 years of experience, and after have experimented in a plethora of beauty products, I have discovered brands that are good to me and become a devoted fan. Primarily due to sensitivity. And of course, the idea of breakouts and allergic reactions just scare me. However! Sibu Beauty contacted me and asked me to review one of their products. I skeptically responded back and chose to review the Sea Buckthorn Rejuvenating Night Cream, designed to protect and repair your skin’s natural lipid barrier and reduce lines and wrinkles. I don’t know about you, but I can usually tell in the first couple of days whether a product is going to work for me. My skin will let me know. And well, I’ve been using the Sibu Beauty night cream for 3+ weeks and truly feel a sense of devotion! I would not steer you wrong, my friend – if I don’t truly stand behind this product, it would not be mentioned here on my blog. 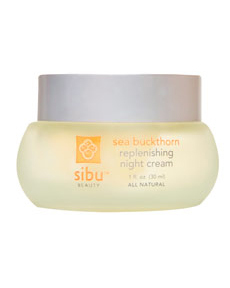 I have never met a moisturizer that absorbed into my skin as well as the Sea Buckthorn Rejuvenating Night Cream. Previously used moisturizers remain sticky to the touch long after I’ve prepped myself for bed. My face no longer sticks to the pillow case after having applied the Sea Buckthorn Rejuvenating Night Cream. Secondly, the cream has a pleasantly light citris scent. And most importantly, my face feels hydrated and supple upon waking. An additional plus: it’s 100% vegan! Meaning its cruelty free + no wheat, gluten, dairy, or preservatives. Mandi, there is no way you're 35!!! And random, what does it smell like? I'm really picky when it comes to skin care products and their scents, ya know? Oh, Katie, I love you! Yes, I am so 35 and am starting to show my age. The scent of the Sibu moisturizer is so very pleasant -- a light citrus scent. Nothing over bearing, and certainly not medicinal smelling. I have a rather sensitive nose, and found it quite lovely.